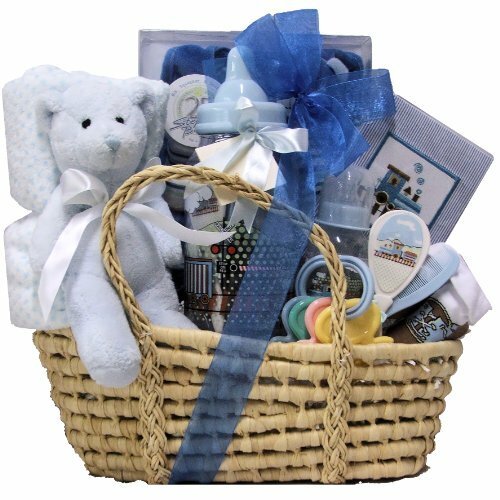 Baby gift baskets are ideal for new babies, baby showers, Christmas, and even first-year birthdays. 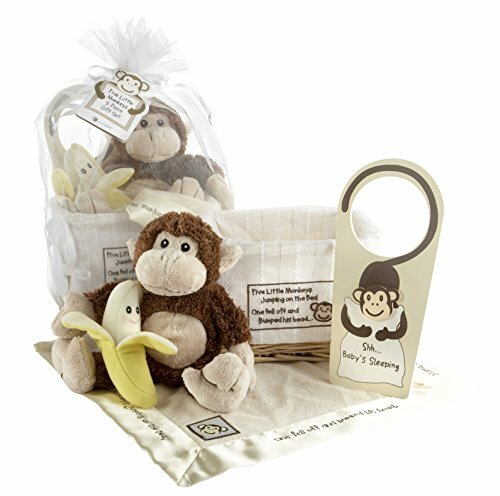 You will find great baby gift basket ideas here for boys and girls, as well as gender-neutral selections. 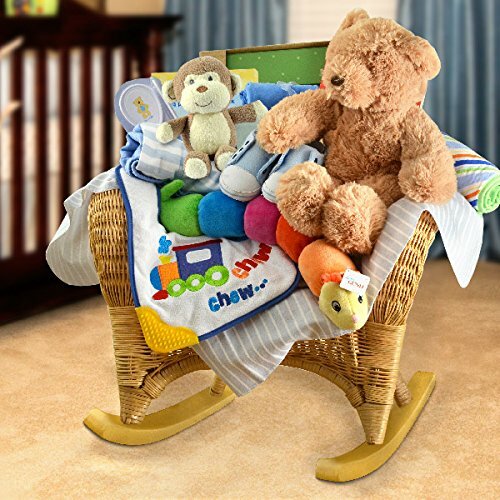 Choose a baby gift basket filled with clothes, bath products, toys, or a combination of these items, and more. You can keep it simple, or buy an extravagant gift basket for baby. Whether you are giving a baby gift basket as a gift yourself, or with one or more other people, there is no doubt that these are fun to give! People love finding cute little treasures buried within gift baskets. Find the ideal baby gift basket here for boys and girls! This gender neutral basket is perfect for any baby boy or girl. A new baby boy is a wondrous gift that warms everyone’s heart. 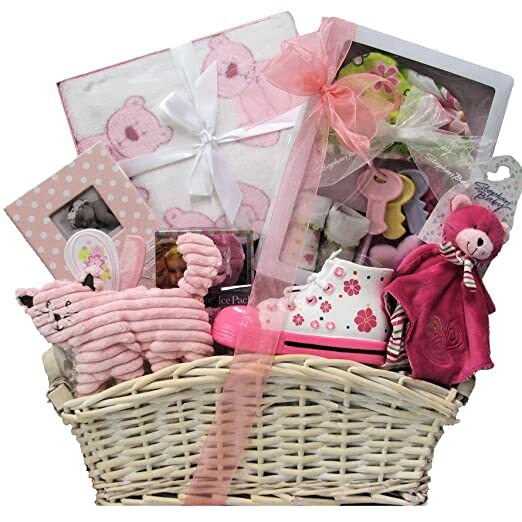 Send welcome greetings of love and joy with this special baby gift basket filled with goodies and useful items for mom and baby. 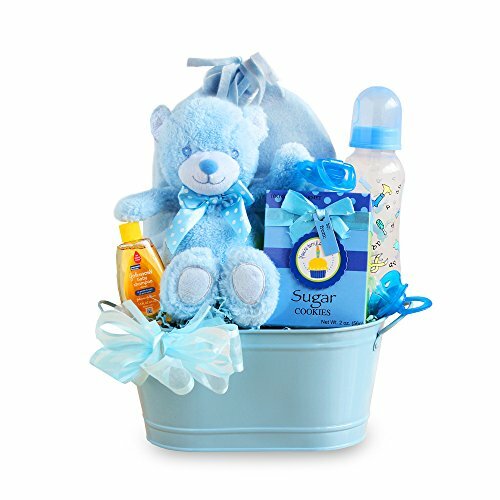 Packed in California, an adorable cuddly blue bear sits atop the blue keepsake tin with a decorated baby bottle, more baby accessories and the most important gift of all-a delicious iced cookie for mom. Made of the finest plush materials and fleece; it’s guaranteed that both the new baby and the new parents will love it! Great for Baby’s First Birthday, or great as a baby shower gift idea! Filled with clothing, bath essentials, gifts and toys. All of the essentials including a plush elephant squeeker rattle, plush teddy bear and “chugga chugga choo choo” themed baby bottle bank, and more. Also features an “it’s a boy” embroidered train design brag book. These baby boy gift baskets will welcome any little guy into the world, and make fun memories for the parents, too! These gift baskets are perfect for any new baby, baby shower, and even birthdays for young toddlers. Includes: dotted baby piggy bank perfect for baby’s first savings , block and booties gift set (includes 100% cotton washcloth with embroidered trim, bath squirter block), pacifier and pair of sneaker style booties, plush super soft bear with gingham tied bow, embroidered “it’s a girl ” brag book with a photo on the cover, heart design matching infant brush and comb gift set in acetate gift box, elephant gift set includes plush elephant squeeker rattle, bear applique infant booties and vinyl lined cotton bib, gift boxed double layered super soft plush bumpy blanket. 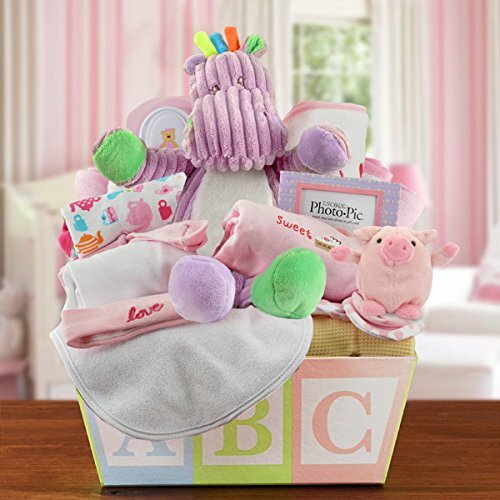 Celebrate the birth of your new little star with this great care package gift box featuring an adorable keepsake plush animal. Included is a matching picture frame, memory candle, full baby outfit set, and more tucked inside. This gift set is available in baby boy blue or baby pink for girls. Thermal Receiving blanket, White one-piece bodysuit, Color print one-piece bodysuit, Sleep gown, Socks, Newborn cap and booties, Washcloths, Hooded towel, Bib, Soft corduroy stuffed animal, Decorated photo frame, Baby animal rattle, Storage container, Multi-colored ABC basket. 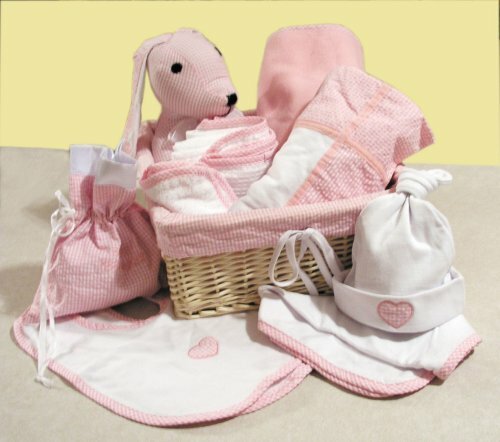 Welcome any baby girl into this world with a special gift basket made just for her. From clothing and toys, to other baby items, these baby girl gift baskets will make any family happy! Perhaps you don’t know whether the baby will be a boy or a girl. In that case, a gender neutral baby gift basket is ideal, because it’s appropriate for any gender.